Given the dominance of the Marvel Cinematic Universe (MCU), it feels strange to remember the days when movies based on DC Comics characters dominated the box office. 2002’s Spider-Man firmly altered this equation, but with era-defining hits like 1978’s Superman and 1989’s Batman, DC dominated in the 20th century. Actually, Marvel barely even tried to compete with DC back then, a fact demonstrated in 1989. While Batman became the year’s biggest hit, Marvel responded with The Punisher, a flick with such tepid commercial prospects that it didn’t even run theatrically in the US. In the more favorable climate of 2004, Marvel gave the franchise another shot via a reboot logically titled The Punisher. With a worldwide take of $54 million, it didn’t exactly dominate at the box office, but at least it showed up on movie screens, an improvement over its 1989 predecessor. This leaves Frank in bad shape and his family slaughtered. Despondent about his loss, Frank adopts the vigilante persona of “The Punisher”, a one-man judge/jury/executioner who sets out to take down Howard Saint. 20 years ago, Jane seemed destined for major stardom. He boasted leading man looks and enough talent that he felt like an actor who should’ve made the leap to “A-list” status. Punisher comes with a standard issue “lone vigilante out for revenge” plot, one with clear Western overtones. As trite as so many of the story’s elements may seem, they still come with the potential to create a reasonably involving drama if put into the right hands. I guess those hands weren’t Jonathan Hensleigh’s. Best-known as the writer of 90s hits like Die Hard With a Vengeance and Jumani, Punisher marks Hensleigh’s directorial debut, and he doesn’t bring a lot of creativity to the proceedings. Punisher often feels “paint by numbers”, as it follows predictable paths with predictable characters and predictable scenarios. This would become less of an issue if the film managed to show a pulse, but since it seems so bland and ordinary that it never threatens to deliver much in terms of excitement. These moments subvert the drama. Not that Punisher needs to offer unrelenting doom ‘n’ gloom, but a greater sense of commitment to darkness would make it more effective. The Punisher appears in an aspect ratio of approximately 2.35:1 on this 4K UHD Disc. Though not a great image, the film looked more than presentable. Overall sharpness seemed positive. Occasional interiors felt a little soft, but the majority of the movie boasted fairly good clarity and accuracy. Jaggies and shimmering created no concerns, and I saw no problems with edge haloes. A grainy image, the movie came with some small specks but nothing major. Despite the movie’s grim subject matter, the palette came with bright hues on occasion, mainly when Frank attended his family reunion. Those looked peppy and lively, and the film’s more somber tones – which pervaded the project – also showed appropriate depiction. Blacks felt dark and deep, while shadows were largely positive. Some low-light shots could come across as a little murky, but the majority offered smooth elements. Again, nothing here impressed, but the image was largely positive. 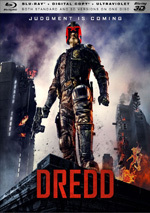 Downconverted to Dolby TrueHD 7.1, the film’s Dolby Atmos added zing to the proceedings. With a lot of violent action scenes on display, the soundscape managed to create a fairly vivid and involving auditory image that managed to place the viewer inside a lot of the mayhem. Music also showed good presence, and quieter scenes managed a smooth sense of ambience. The soundscape could – and probably should – be a little more active than it was, but all in all, it suited the material. Music offered good range and punch, while effects brought out vivid, accurate information that included pretty positive low-end. Though not a reference soundtrack, the Atmos mix appeared strong enough for a “B+”. How did the 4K UHD compare to the Blu-ray from 2004? The Atmos audio showed more involvement and kick compared to the BD’s lossy DTS mix, and visuals boasted a major step up. One of the earliest Blu-rays, the 2006 disc seemed bland and drab, so the 4K UHD delivered clear improvements in terms of sharpness, blacks, colors, shadows and print quality. This might not be a great-looking image objectively, but it created an obvious jump from the barely mediocre Blu-ray. Whereas the 2006 BD included no extras, the 4K comes with a bunch, all of which appeared on the movie’s original 2004 DVD. First comes a running, screen-specific audio commentary from co-writer/director Jonathan Hensleigh, as he discusses tone and his approach to the film, story/character areas, cast and performances, sets and locations, editing and deleted plot lines, the adaptation of the source, cinematography and production design, effects, stunts and action. That’s a pretty complete overview of topics, and Hensleigh covers the material well. He moves along the chat at a brisk pace and keeps happy talk to a minimum. Heck, Hensleigh even points out mistakes and comments on criticisms, factors that turn this into a well above-average track. Two Deleted Scenes fill a total of three minutes, 12 seconds. We see “Introduction of Saints and Sinners Club: Howard, Livia & Quentin/Intro to Bobby & John Saint” (2:40) and “Livia Saint Insults Mickey Duka” (0:32). “Introduction” adds a smidgen of character information, but we don’t get anything memorable. “Insults” also seemed like a minor addition, so neither goes missed in the final cut. We can watch the scenes with or without commentary from Hensleigh. He gives us some notes about the sequences but he fails to tell us why he cut them. Some featurettes follow, and these launch with Keepin’ It Real lasts 27 minutes, 45 seconds and includes info from Hensleigh, stunt coordinator/2nd unit director Gary Hymes, assistant stunt coordinator Mike Massa, producer Gale Anne Hurd, combat weapons trainer Michael Mello, cinematographer Conrad W. Hall, stuntmen Keii Johnston and Mark Chadwick, stunt doubles Jeff Moldovan and Mike Owen, and actors Thomas Jane and Kevin Nash. “Real” looks at the film’s stunts and action. Helped by ample footage from the set, it becomes an informative look at this aspect of the production. Next comes Army of One, a 12-minute, 55-second reel with Marvel CEO Avi Arad, comic book writers Gerry Conway, Garth Ennis and Steven Grant, comic book artists John Romita Sr. and Tim Bradstreet, Marvel Studios VP Ari Arad, and Liongate theatrical marketer Eric Lieb. “One” discusses the origins of the Punisher, his development over the years. It provides a short but useful piece. With War Journal, we get a 29-minute, 59-second program that features Hensleigh, Hurd, Avi Arad, Jane, Hall, line producer John Starke, fitness trainer John McLaren, costume designer Lisa Tomczeszyn, executive producer Kevin Feige, production designer Michael Hanan, composer Carlo Siliotto, and actors Laura Harring, John Travolta and Rebecca Romijn-Stamos. A general production overview, “Journal” leads us from the beginning of the shoot through the movie’s premiere. It becomes another enjoyable view of the film’s creation. Lastly, Drawing Blood occupies six minutes, 22 seconds with remarks from Lieb, Bradstreet, and Ari Arad. We learn a little about the movie’s poster art in this decent featurette. We also find a music video for “Step Up” by Drowning Pool. A mix of ugly guys trying to look like badasses while they cavort with hot bikini-clad women, the video attempts some form of a story but not one that goes anywhere. The video’s so bad it feels like a parody of the genre’s excesses. 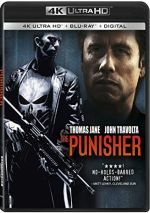 A second disc provides a Blu-ray copy of Punisher. It lacks any of the 4K UHD’s extras. As a violent, “R”-rated tale, The Punisher delivers intermittent thrills at best. While it gives us the occasional impactful moment, too much of it feels generic and forgettable. The 4K UHD brings decent visuals, very good audio and a nice set of supplements highlighted by an unusually honest commentary. Though the movie doesn’t work for me, fans should embrace the chance to upgrade the iffy Blu-ray.